How can growing cities ensure the well-being of their citizens isn’t sacrificed in their growth? That was one of the questions I had in mind when delivering a guest lecture on happiness to a group of students from Erasmus University Rotterdam in the Netherlands. The students, enrolled in a programme on city development, were specialising in ‘Urban Development, Wealth and Well-Being’. 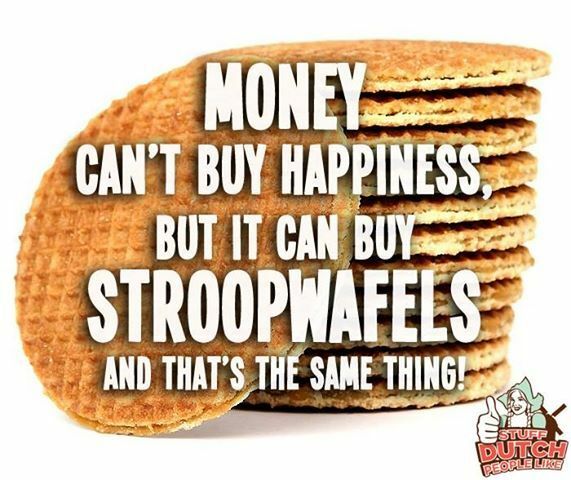 Studies of happiness seem to have gotten a lot more common in the few years I’ve been out of university! My presentation was centred on the argument that the well-being and happiness of citizens should be a leading objective in urban planning and city development. Politicians and policy-makers should use existing regional indicators, such as the OECD Better Life Index or the Social Progress Index (SPI), to monitor their performance. Comparing scores with benchmarks of their peer group can help spot weaknesses. For instance, the Brussels region has a high GDP, but is doing worse on many other progress indicators, as the slides in the deck below show. 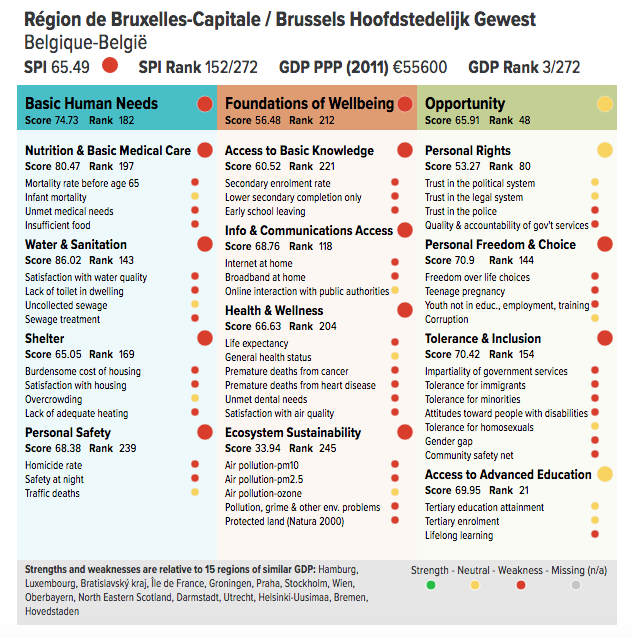 The South Holland region of Rotterdam and The Hague ranks highly in the SPI, but shows weaknesses in education, environmental quality, and some health and safety indicators. Students in the group seems to see the arguments, but also had critical questions: can you objectively measure what happiness or well-being is? Can you decide for someone else how much education or the environment counts for their happiness? And can we trust politicians using well-being data fairly? Or would they simply use it as a narrative to get support, without doing the actual work? I ended the workshop with several case studies, asking the students how they would advise mayors to resolve policy issues. They had some creative solutions: for instance, one of the case studies described a dynamic city that attracts so many people that house prices saw massive increases. One, admittedly complicated, suggestion was to cap rent prices so normal people could afford to live there. This case study was meant to be similar to London. Another creative idea by the group was to build a satellite city at a reasonable distance. In this way, people could enjoy well-being in their place of residence, while also enjoying the dynamic life that London has to offer. One thing became clear: the next generation of urban planners will be thinking about happiness in their cities. 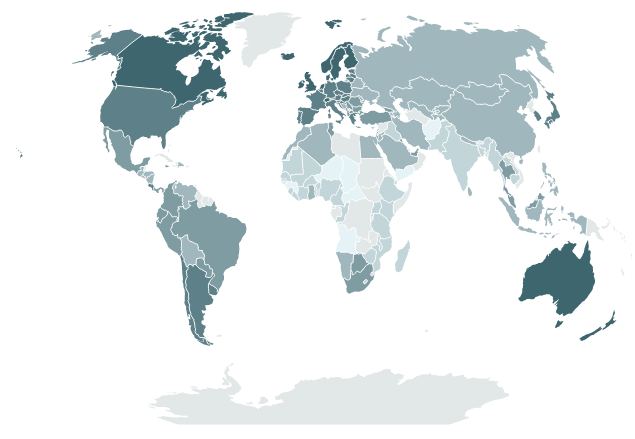 The Social Progress Index: is your region better than its peers? One of the common themes in my explorations on this blog has been in ‘alternative indicators’, or tools that are better equipped to measure quality of life than Gross Domestic Product (GDP). One of the most prominent ‘beyond GDP’ tools is the Social Progress Index, which I labelled “a better way to measure a good society”. And the SPI has seen a lot of development since my post of last year. Let me start with a recap: the Social Progress Index (SPI) is developed as a broader notion of progress than GDP. It consists of 53 indicators, under the headings ‘basic human needs’ (shelter, access to clean water), ‘foundations of well-being (health, internet access) and ‘opportunity’ (human rights, social tolerance). Typically, countries tend to score higher on basic human needs, as these often are met in high and middle income countries, even if they don’t meet the same standards on the social issues. Roughly speaking, performance for opportunity is lower, even in the richest countries. The exercise has been conducted for a couple of years now. In the 2016 update released this June, the list is topped by Finland, Canada and Denmark. The aim of the index is similar to other beyond GDP tools I discussed like the OECD’s Better Live Index. Namely, to identify the areas of ‘progress’ or well-being in which a country is doing well, and those where it is underperforming peers. The concept of peer group is an important facet: the strengths and weaknesses are listed in comparison to a 15-country group of peers with similar levels of GDP. This type of screening tool, in theory, could be used to help countries identify in which policy areas they could invest. The thought is that by learning from over-performing peers’ best practices, countries can use their limited resources in the most efficient way, namely by generating the highest additional well-being. The SPI has expanded a lot in the last year, starting projects with the US State of Minnesota, Reykjavik, Iceland, in the capital Bogota, other cities in Colombia and elsewhere in Latin America. In practice, indeed, the differences within countries are more important than between countries. More granular data at the regional and local indeed provides a lot more hands-on information to policy makers on where, and how exactly, they can do better. And the Brussels capital region may be better compared to another large city, like Hamburg, then to the province of Belgian Limburg, which in turn could learn more from a region of similar GDP as East Anglia. That’s why both the OECD and the SPI have been complemented with data on regional level. In 2016, the SPI launched a pilot overview of the 272 regions in the EU. The Commission has released the data of the exercise in February, and an updated version is due to come out in October. And where OECD uses only 11 indicators, the European regional data provide 50 out of the original 53 of the SPI. They also built in the peer group comparison in the methodology. Once we start comparing regions with each other in Europe, very quickly the next question comes: will the unprivileged regions get more money to bridge gap?Conceptually, one could argue that using the SPI data to address specific low performance areas is a good way to aiming investment at the area where progress can be made. But money is sensitive, and in presenting the data, the Commission has been crystal clear that it doesn’t want to revise this funding policy. Nonetheless, the granular data can provide what is necessary: a better way to measure a good, regional, society. 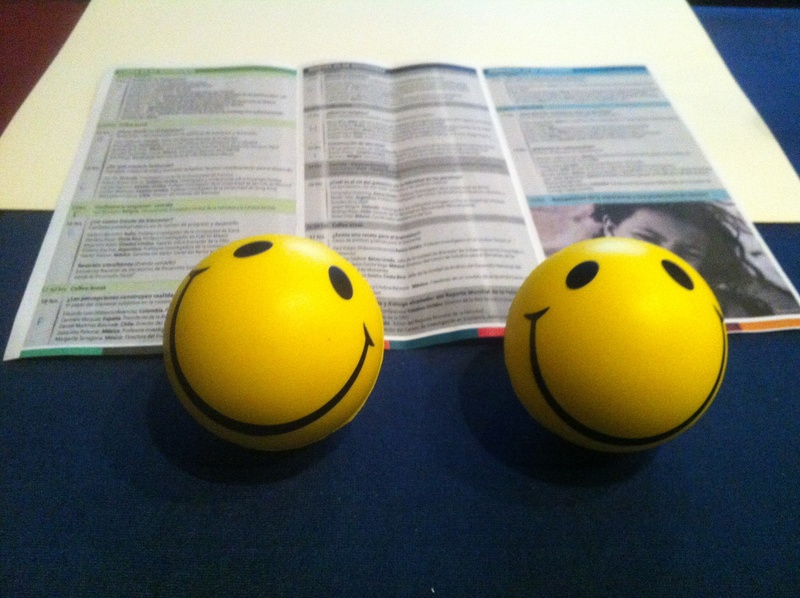 What serious message can a tiny, bright yellow, stress ball with a smiley convey? Last week I shared a couple of lessons I learnt from other speakers at the well-being and development conference in Guadalajara. Today, I wanted to tell you about the points of my own presentation. 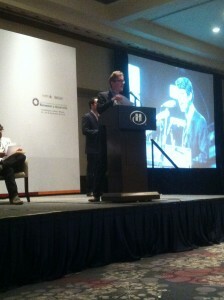 The panel I was on had the title ‘what is the role of governments in happiness of the people? I used this little yellow ball to illustrate my message. I realised that many participants were triggered by these little balls in their welcome pack. Some people took pictures of them, holding them in front of their face or their bag and tweeted them. Probably, others just left them in a corner or threw them away. And myself, I decided to juggle with them at the beginning of my speech. Is there a message in (very poorly!) juggling with stress balls? I argued there was. My point was simply: everybody will use tools you give them in a different way. You can bring a horse to the stream, but you can’t force it to drink. Sometimes a horse just wants to splash the water! It’s the same with public policies: as a government you can design policies that you hope make people happier, but you can’t control how they will react. Still, I think there is large responsibility for governments to create the underlying conditions in which citizens can strive. Long-term well-being and quality of life combine subjective elements (our emotions, how we react to circumstances) and objective elements (the environment we live in). This environment is partly shaped by governments’ economic, environmental and social policies. If good or bad choices are made, that will ultimately influence the quality of our lives. Firstly, I advised them to carefully measure the well-being in their jurisdiction. Well-being indicators from all areas – economy, environment, social affairs, health, education, and others – should be measured together, rather than in isolation. Now, in most countries, GDP is the main metric that is used in public policy. 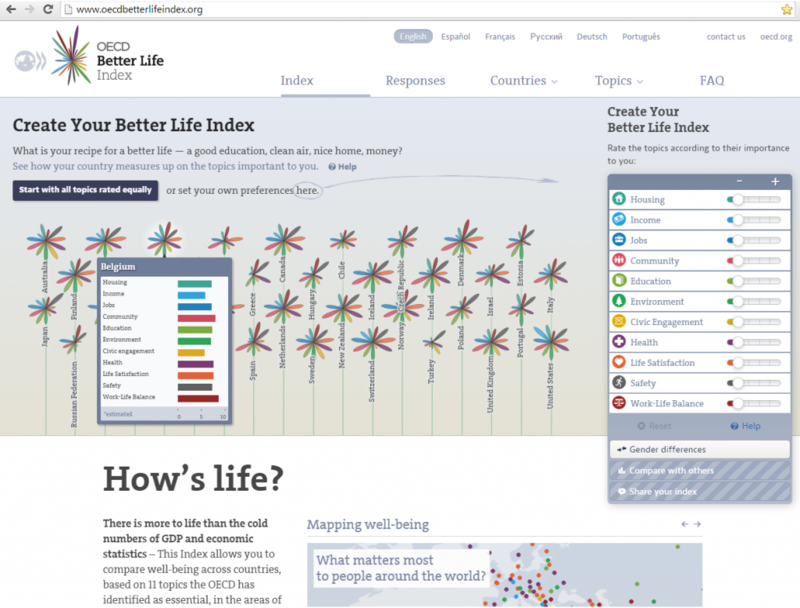 I argue that a dashboard of several indicators, such as in the OECD’s Better Life Index, is a good tool to have an additional layer of information. As such, policy makers can detect in which area improved policy outcomes can win the most in terms of quality of life. This can help them to focus their resources on the areas where they can make the biggest difference. Secondly, I suggested to treat well-being as a political agenda like any other. If the focus will be more on quality of life and well-being, and less on purely economic growth, that is a massive shift in policy! Administrations know that they have to communicate all their policies to citizens and engage in a public debate to explain the choices the made. This applies to well-being just the same as to other areas. Thirdly, I advised to also look at the happiness at work of staff in the administration. Motivation and job satisfaction at an individual and team level massively affect the success that an administration will have in the implementation of it its policies. Surveys can be used to monitor and improve work satisfaction and working conditions of the staff responsible to deliver the well-being policy objectives set by politicians and policy makers. Only happy staff can create happy citizens. Now it is to the administration of Jalisco to translate the lessons from me, and all other speakers, into new and better policies. To be continued!